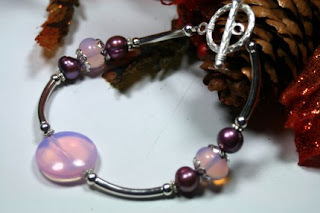 I introduced Jerry from Twilight Shades in my first Twilight inspired giveaway for the beautiful Bella Crystal Necklace. Jerry is also the creator of Shadesongs, an Etsy shop where she offers a mix of Sterling silver, altered alt and charm bracelets and my favourite, Twilight and photo pendants with matching tins. Her items are all so pretty and I love the Twilight jewellery! 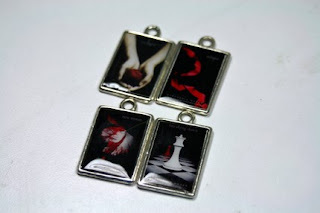 Shadesongs has generously offered a set of the Twilight Book Covers Altered Art Charms to one of my readers. They are a set of 4 resin pendants, each with a thick layer of crystal clear resin. The pendants are just at 1 inch high, and are lead free. Just add some jumprings or a ribbon and you are set! They are a great collector item for the Twilight lover out there with a retail value of $10 USD. 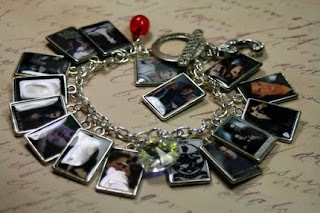 Are you interested in winning the Twilight Book Covers Altered Art Charms?